Cornbag Warmer (Microwavable Corn Heating Pad) sizes can be found by clicking here. All of our warmers have a tag on them. You will find it helpful to read both sides because they have size & heating info on the tag. If you are not sure what size your Cornbag Warmer is or if you have any other questions, please click here to contact us before using your warmer. 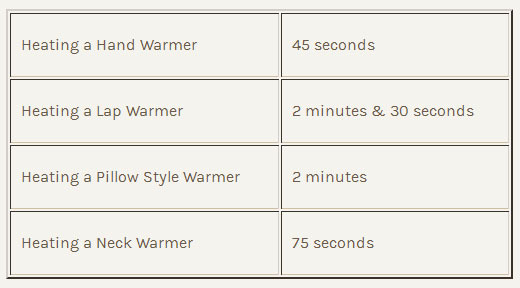 Please read this entire page - these instructions only apply to warmers we manufacture. Heating a Microwave Corn Heating Pad is Easy! If you follow these instructions on this page, you should enjoy your Cornbag Warmer for many years!! We hope you fall in love with yours just like we have! ONLY use a Microwave Oven. Leave the outer decorative cover on (see below if it's not clean!). Place your warmer toward the center of the microwave oven bottom. You may have to fold it over on itself if it doesn't fit. The warmer should be the only thing in the microwave. If the warmer has already been heated (i.e. it isn't cold), then heating times will be less. If your microwave has a shelf of any kind, don't use it unless it is made of glass or heat safe plastic. We encourage you to watch your warmer as you heat it the first few times until you get a feel for how your microwave heats. If you've overheated your warmer - be careful! It will be hot so let it cool in a safe area before using it. The heating recommendations are based upon years of experience using 1000 watt microwaves (the most common kind). If using a microwave greater than 1000 watts, the heating times will be less. Never use a Corn Bag Warmer with an infant or toddler. An adult should always test heated warmers before letting the kiddos use them. Corn Bag Warmers give off Moist Heat - make sure that wherever you set a heated warmer can tolerate the heat and moisture that will be given off. If your microwave oven does not have a rotating platform (carousel), then you may need to turn and/or rotate the warmer during the heating process. Never use a conventional oven or anything other than a microwave oven. Don't use an industrial microwave like they have in food service. If the outer cover has oil or anything flammable spilled on it, it must be cleaned before use. Finally, if the inner corn bag has anything spilled on it, your warmer smells burnt or appears to be damaged in any way, Don't use it - contact us for a replacement. How do I clean my Corn Bag Warmer? The following instructions will explain how to clean your Microwaveble Corn Heat Pack (Corn Bag Warmer). Can you wash Corn Bag Warmers? 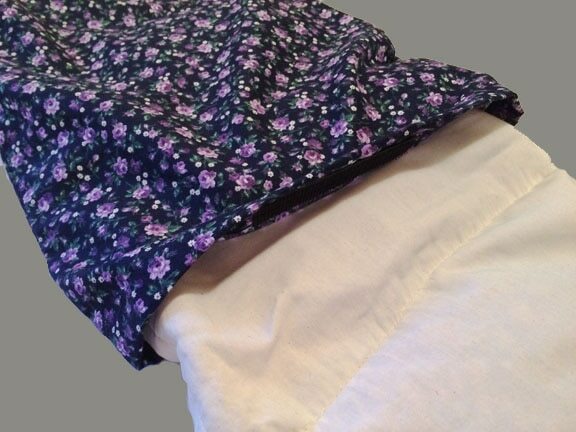 The outer cover can be washed in the washing machine or hand washed using soap and water. Dry it the same way you would dry any nice piece of clothing. Never put the inner corn bag into a wet outer cover. Never do anything that will get the inner corn bag wet. Do not use any types of solvent or cleaning agents. DO NOT wash the inner corn bag. If your inner corn bag gets ruined, please click here to contact us to purchase a replacement. If you follow these instructions, you should expect your Microwavable Heat Pack to last for many years. Because of their moist heat, these are simply The Best Heating Pad available!